The playoff window is closing quickly for the Texas Stars (24-27-2-2, 52 pts, #15 Western Conference), as the club collected only two of a possible six points this week. All three games this weekend were against divisional opponents, who need the points just as much. 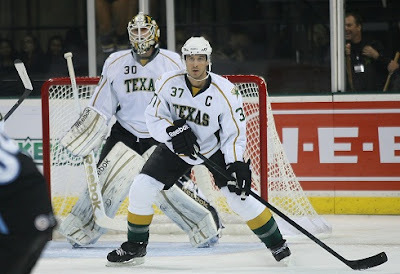 Texas had accomplished a streak of four home game wins coming into Saturday's game against the Aeros (Minnesota Wild). Including five against on Saturday, Texas allowed 12 goals in three games and only scored six. The playoffs are slipping away right now for Texas. The Stars are in last place in the conference and can only afford five more losses before the window closes pretty much completely. Some may call it a lost season, but that's an AHL viewpoint. For Dallas fans, every season has potential whether you win the Cup or you're golfing by Tax Day. Big storylines this year for Texas include the emergence of Richard Bachman to the backup role in Dallas and the growth of Philip Larsen and Tomas Vincour to become every day NHLers. Further, Texas has some great prospects budding up among their ranks. Older guys like Ryan Garbutt and Jordie Benn played their first NHL games this season after starting their careers in the oft-maligned CHL. Free agent signees (and roommates, no less) Matt Fraser and Brenden Dillon have begun to mature their professional game and could have long NHL careers thanks to wise scouting from Dallas. And finally, drafted prospects like Scott Glennie have taken big steps forward toward NHL careers. While it may be a tough season for Texas fans, Dallas fans have many things to be happy about moving forward. This was a real momentum killer for Texas. After winning four straight at home, Texas laid an egg against Houston in the second night of a back-to-back. Houston and Texas were tied in the first but the Aeros potted four straight afterwards en route to a 5-2 win. Tyler Beskorowany took the loss, stopping 32 of 37 shots. The Stars were outshot 37-23, including a 13-4 mark in the first period alone. The Texas Stars (24-27-2-2, 52 points) were defeated by the Houston Aeros (26-17-3-9, 64 points) 5-2 in front of 6,429 fans at the Cedar Park Center on Saturday night. Aeros center Chad Rau led the way, scoring one goal and setting up two others, helping his team end a four-game winless skid. Veteran forward Jeff Taffe also netted two goals, as Houston improved to 6-2-2-1 against Texas this season. Houston goalie Matt Hackett (17-13-4) stopped 21 of 23 shots as the Aeros moved to 17-10-0-3 on the road. Stars’ defenseman Jordie Benn registered two assists. 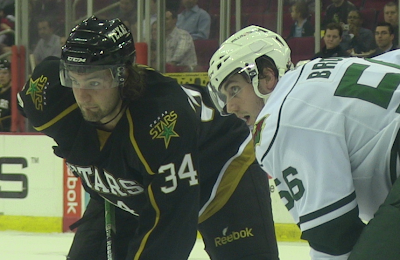 Defenseman Brenden Dillon and right wing Colton Sceviour each scored for the Stars. Texas goalie Tyler Beskorowany (8-14-0) stopped 32 of 37 shots as the Stars fell to 14-9-2-1 at home. The Stars travel to Abbotsford to take on the Heat on Friday, March 2nd at 9:00 P.M. The Aeros put up the first goal of the night with a shot from forward Jeff Taffe just 1:18 into the first period. Right wing Jon DiSalvatore and forward Chad Rau each added an assist for the 1-0 lead. The Stars evened the score, 1-1 as defenseman Brenden Dillon slapped the puck past Hackett at 8:39. Defenseman Jordie Benn assisted on Dillon’s third tally of the season. Houston pushed out to a 2-1 lead early in the second period with a goal from defenseman Kyle Medvec at 2:47. Left wing Kris Foucault and center C.J. Stretch set up Medvec’s first goal of the year. The Aeros extended their lead, 3-1 at 7:37 as forward Jeff Taffe put in his second tally of the night. Forward Chad Rau helped on the play. The Aeros struck again just 42 seconds into the third period as forward Chad Rau knocked a shot past Beskorowany. Forward Justin Fontaine and center David McIntyre each registered an assist for the 4-1 tally. Houston center David McIntyre slipped the puck past Beskororwany on a penalty shot at 9:22, giving the Aeros a 5-1 lead. Texas scored with 2:09 remaining in the final frame with a goal from right wing Colton Sceviour. Defenseman Jordie Benn and left wing Matt Fraser each supplied an assist for the 5-2 final. Note: I won't be able to see tonight's game live so follow @TexasStars and @TheJoshFisher for live updates. It's the same matchup as last night once again today for the Texas Stars. Houston stays in town for a second helping of what the Stars hope will be goals against and frustratingly solid goaltending. The Stars look to extend their home winning streak to five games with two important points. Right now, Texas is confident in their game, believing they can play with any team in the conference at home or on the road. Tyler Beskorowany said after last night's game, "We both play on the same ice. We can beat any team; we've proven it." Beskorowany is also confident personally. Coach Pyle could very easily go with the Sudbury native again in net tonight, given his recent play. As to other line up changes, it currently looks like Philip Larsen is fine after getting a puck to the head in Dallas last night, so no callup from Texas should be needed. Texas opened a two game set with Houston this evening in Cedar Park with a win, their first in Central Texas over the Aeros this season. The 3-2 regulation win stretched their home winning streak to four games, reaching back to the February 8th game against Milwaukee. When asked about the streak, Coach Pyle added, "Winning everywhere is crucial. We just don't play smart enough on the road to win." Texas picked up goals from Glennie, Esposito and Wathier while Tyler Beskorowany played a gargatuan game, stopping 39 of 41 shots against. "Getting a couple of wins here in the last few weeks, my confidence level is definitely up there right now," said Beskorowany. Coach Pyle added, "He's been playing better and better in the last few weeks. He made some huge saves for us [tonight] and calmed things down." Texas opened the scoring in the first period with Scott Glennie's 12th of the year, a bit of a mad scramble in which Glennie potted the goal from behind the icing line, bouncing it in off Kuemper's skate. Sceviour and Lukowich assisted on the play. The goal would be the only regulation tally of the night for either club. Coach Pyle felt that the officiating was a little uneven in the game, but in the end, each club got two power play goals. Two Houston skaters were sequestered in the box early in the second, allowing Texas's power play to go to work. Travis Morin found Angelo Esposito on the back door on a cross-crease pass for the 2-0 advantage. Houston answered seven minutes later as Fredheim's shot trickled through Beskorowany's pads and crossed the line. Moving to the third, Texas added the eventual game winner thanks to the Swagger line once again. Wathier got his 12th of the year popped one past Darcy Kuemper, assisted by linemates Sceviour and Glennie. "Wathier and Sceviour are so good for Glennie," said Coach Pyle. "To get him to learn the ropes and the work ethic. They've rubbed off on him, and you can see the chemistry." The Aeros would add one more tally as Stars-killer Jon DiSalvatore found the net on a 5-on-3 power play. A frenetic last few minutes gave way to a Stars' victory, a regulation victory no less, keeping Western Conference opponent Houston from gaining any ground in the playoff race. These two clubs meet again tomorrow in Cedar Park. Texas rotated defensive pairs all night, so the lineups above are not particularly accurate. The pairings can best be summarized as all having either Benn, Dillon or Lukowich on them. All the other blue liners rotated out of the second spot at will. Coach Pyle on Fortunus: "We know it's going to be a while, but I'm not a doctor so I can't say what his injury is." Coach Pyle on Spang and Labrie: "It's going to be a little while for Spang and Labrie as well." Houston visits the Cedar Park Center this evening to start a two game set against the Texas Stars this weekend. The Aeros are currently on their longest road trip of the year, eleven games, and Texas will be games 7 and 8 of that stretch. Houston is 2-4 on the trip so far. They come into the Cedar Park Center with a 3-0-0-1 record at Texas this season. Tonight's game could well be rechristened as a battle of the ECHL All-Stars. Aeros injuries and call-ups include Matt Hackett, Jed Ortmeyer, Marco Scandella, Matt Kassian, Nate Prosser, Carson McMillan, Warren Peters, Jeff Penner, Mike McKenzie and Jarod Palmer. Meanwhile, Texas is without Larsen, Vincour, Garbutt, Fraser, Sawada, Labrie, Spang, Schultz and Fortunus. "It is difficult on the team, but it is just a situation everyone goes through," Houston coach John Torchetti told the Houston Chronicle. "I'm sure others have gone through it, but not with the numbers we've had." The Aeros have been forced to play some games on their trip with as few as 16 skaters. Texas has yet to have anything less than a full bench, thanks to GM Scott White's extensive Rolodex and persuasive tone. Texas will add a new body to the rotation tonight as Cameron Brodie could suit up for his first AHL action, depending on the health of Dan Spang, who Coach Pyle said could return for Wednesday's game at OKC but did not. The big piece that has kept Houston afloat this season has been goaltending, as Hackett has stuck around for much of the season to tend net for the club. Darcy Kuemper has filled in well in his absence additionally. Tonight Kuemper (6-4-1, 2.33 GAA, .923 SV%) is likely to get the start as Hackett is with Minnesota in Dallas. Rob Nolan is the backup, having split time between the ECHL's Toledo, Chicago and Colorado. While Houston is looking to set up some home ice advantage for the playoffs, the Stars are peering over the edge into the abyss of their first non-playoff year in franchise history. Given the current playoffs pace, Texas would need to rattle off an 18-5 last month and a half of the season. While nothing is impossible, practically the Stars are looking at a very steep hill to climb to make it to the postseason once again. Texas defenseman Maxime Fortunus did not finish last night's game in Oklahoma City, suffering an injury in the first period. He was, in fact, in street clothes long before the Barons scored their fifth goal of the night in the third period. 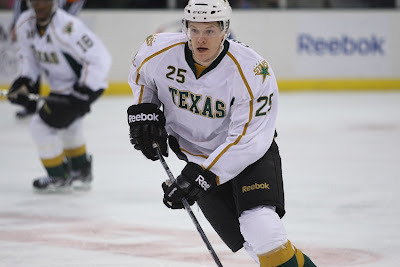 To remedy that, Texas today signed Cameron Brodie out of the ECHL. Brodie comes from the Stockton Thunder, which previously employed former Star Tyler Shelast this season. 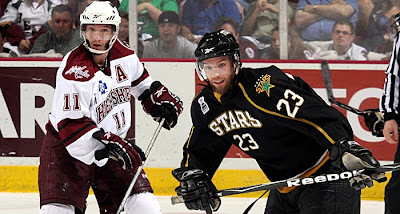 Depending on the health of Dan Spang, Texas could play Brodie tomorrow night against the Aeros. 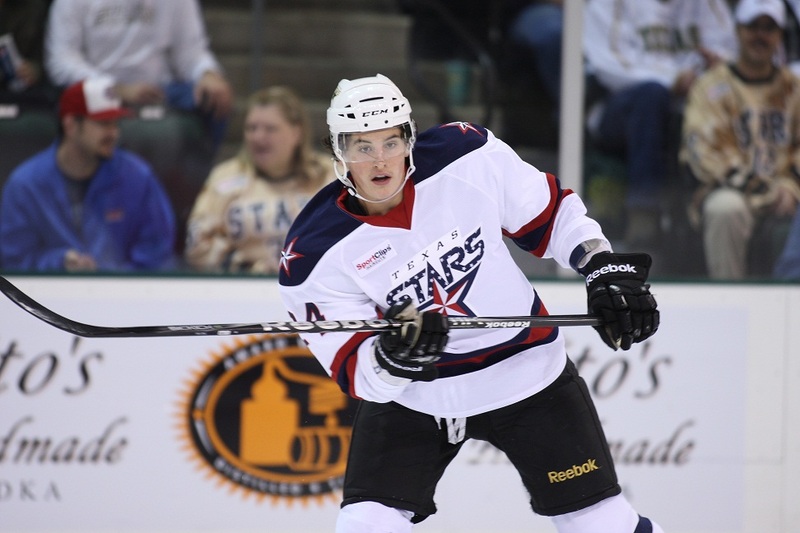 The Texas Stars announced on Thursday that the team has signed defenseman Cameron Brodie to a PTO (professional tryout agreement). Brodie is a second-year pro who spent the first 43 games of the year with Stockton of the ECHL. In his time with the Thunder, Brodie totaled five points (all assists) and 54 penlaty minutes. He also spent his rookie season with Stockton in 2010-11, scoring two goals and totaling 12 points in 60 games played. Prior to turning pro, the 23-year old played junior hockey in the BCHL from 2004-09 and one year at the University of British Columbia in 2009-10. Brodie will look to make his AHL debut this weekend when the Stars host the Houston Aeros. Texas started out strong in Oklahoma City, looking like they would get the best of the Barons, but ended the night with another L. After a first period power play goal by Texas, the Barons scored the next five straight for a 5-1 final. Andrew Raycroft started the game but was pulled in favor of Beskorowany after allowing four goals on 18 shots. Beskorowany stopped 16 of 17. Jordie Benn scored Texas's only goal. In addition to the Stars' goals against trouble, Maxime Fortunus was in street clothes by the third period with what was being called an upper body injury. It is not expected that he will be available for the weekend. The game started physically with Kirill Tulupov delivering a hard check to a puckless Mathieu Tousignant. Every Star on the ice descended on Tulupov with Nick Layton getting there first and taking him to task. Tulupov received a major for interference and Texas made them pay up, scoring on the PP. Jordie Benn broke into the zone unaccosted and beat LeNeveu clean for the 1-0 lead. Texas looked like they would go the break with the lead in tact but a 5-on-3 power play gave OKC its first of the night on a Arcobello shot that tipped off Lukowich's stick. Within five minutes of the first, the floodgates were open and the Barons added two more goals for a 3-1 lead. Keller had a slow roller dribble in 1:19 into the second and Helmer got a tip by Teemu Hartikainen three minutes later. Mark Arcobello scored his second of the night at 12:25 and ended Andrew Raycroft's night after four unanswered. Triston Grant would add another in the third to rub a little salt in the wound. Texas can afford precious few more losses before the season has officially slipped away. Without a weekend sweep of Houston, things are very dicey in the playoff race. Just as Texas was hitting a stride, Dallas has been hit with injuries. Jake Dowell is out for the next week with an upper body injury suffered in last night's game at Montreal. Dallas has elected to recall Matt Fraser to replace him on the roster. Fraser had three goals this weekend against San Antonio and would have been a key piece for the Stars tonight in Oklahoma City and this weekend against Houston. To replace him in Texas, the Stars have recalled forward Nick Layton from the Allen Americans of the CHL. Layton was signed to a standard player contract on July 19th, 2011, and assigned to Allen in the first round of cuts from camp on October 3rd. In 50 games, he has 13 goals, 23 assists, 20 PIMs and an even rating. This one-for-one trade leaves Texas again with only twelve healthy forwards. The Dallas Stars announced on Wednesday that the club has placed center Jake Dowell on injured reserve with an upper body injury retroactive to Feb. 21 and recalled forward Matt Fraser from the Texas Stars, Dallas’ primary affiliate in the American Hockey League (AHL). The Texas Stars have recalled forward Nick Layton from the Allen Americans, the Stars’ Central Hockey League affiliate. Fraser, 21, appeared in his first career NHL game earlier this season against Anaheim on Jan. 24. In 50 games for Texas this season, Fraser ranks second on the team in scoring with 42 points (26 goals, 16 assists). He leads the club with 26 goals and ranks fourth overall in goal scoring in the AHL. The 6-2, 207-pound forward was signed to a three-year entry-level contract by Dallas on Nov. 17, 2010. Layton has played in 50 games for the Allen Americans of the CHL this season. During his time with the Americans, Layton scored 13 goals and added 23 assists for 36 points. The 23-year-old forward turned pro after playing the 2010-11 season at the University of New Brunswick, posting one goal and six points in 24 games played. In 2010-11, Layton joined the CHL’s Bossier-Shreveport Mudbugs for their playoff run. The right wing played in 20 playoff games, scoring seven goals and totaling 17 points to help the Mudbugs win the CHL’s Miron Cup. After sweeping the San Antonio Rampage's visit to the Cedar Park Center this weekend, Texas strikes out on the road to take on the top team in the conference in the OKC Barons. The Barons have pretty much led the conference, if not the league, for the entire season. Considering the wide difference in points between the two teams, Texas has played OKC tight this season, earning two of five wins against the club. It is always a big measuring stick game when the two meet this season. Tonight's game is the biggest one of the season. Can a newly revitalized Texas club keep pace with the world-beater Barons? If so, what does that say for their chances in the remaining games? Yann Danis, top goalie for OKC, is currently up with Edmonton, but that is no bother for the Barons as David LeNeveu ranks second in goaltending in the AHL behind Danis. The vets have splits starts pretty evenly this season with 33 for Danis and 21 for LeNeveu. Danis is 21-10-1 with 1.98 GAA and .926 SV%. LeNeveu clocks in at 12-6-2 with a 2.05 GAA and .923 SV%. With both tenders having twice as many wins as losses, they are nearly statistically identical. It's a game of interchangeable parts in net for the Barons. The Stars need to continue to find (or re-find) their identity. Both goaltenders had big wins on the weekend and the offense was clicking last week with eleven goals in three games after being shutout in Hamilton. Players like Matt Fraser and Travis Morin need to be what they are, goal scorers and point generators. The Swagger line (Sceviour-Wathier-Glennie) needs to contibute in all three zones to be effective. Finally, secondary scoring needs to be there to finish off the effort. Goals from players like Hedden can help in this regard. Despite being at thirteenth in the conference, the Texas Stars (23-25-2-2, 50 pts, #13 Western Conference) are on the upswing right now. Previous mired in last place, the Stars found a way to beat the white-hot San Antonio Rampage (Florida Panthers) not once but twice this past weekend to brighten their chances at a playoff berth. Important games against divisional foes, all in the top eight of the conference, lie ahead in the next few weeks. The Stars' next five are against the division and fourteen of the remaining twenty-four overall. The Stars are thin on extra bodies at the moment with the callup of Ryan Garbutt and injuries to Stephen Schultz and Dan Spang. Schultz's injury was particularly graphic, as he received a high hit from Bracken Kearns and left the ice bleeding from his eye. Even with callups, the Stars only have twelve healthy forwards and six healthy defensemen right now. And yet they are finding ways to win. "Everybody contributed," said Pyle. "It was a really great weekend." Texas needed four points on the weekend to stay in the playoff chase and they got all four thanks to tonight's 4-2 win over the Rampage. Coach Pyle already has the team in playoff mode. "This is our playoffs. We did everything possible to win. That effort has to be from twenty guys every single night." Texas got goals from Fortunus, Sceviour, Fraser and Hedden in the game and rallied from a 2-1 deficit to score three unanswered in the third period. "We're a desperate hockey team right now and that's when we're most dangerous," said game winning goal scorer, Matt Fraser. "We really feel like we have a team that can make some noise." The first period was far less eventful than last night's four fight fracas. Texas had three power play opportunities, including a 5-on-3 opp to end the period. Maxime Fortunus snuck down low and blasted one from the hashes to beat Markstrom high on the stick side off a Morin pass. San Antonio answered to start the second period as Texas failed to clear a puck and, on the rush out of the zone, left Greg Rallo uncovered on the left wing side. He banged home a rebound for his thirteenth of the year and the tie game. To start the third, San Antonio got on the power play and broke an 0-for-12 streak on the PP with a Bill Thomas goal off a broken play in front. "We played hard in the third of a lot of games and not finished," said Coach Pyle. "This win was a little bit of confidence. The effort was second to none." The rally began with Jace Coyle snapping a shot to the net off the rush that Colton Sceviour tipped to tie things at two each. Matt Fraser scored the eventual game winner, again off the rush, with Angelo Esposito slipping one over to the streaking Fraser down the right wing side. "Markstrom is such a big goalie that you want to get the puck off as fast as you can," said Fraser. "I didn't even look; I just tried to get it off." The puck beat Markstrom stick side high for the 3-2 lead. It was a strong play by Fraser, but he was quick to deflect praise even as he approaches the franchise goal record of 27 (Gagnon 09-10, Rallo 10-11). "You look at every goal you score. There's always a guy doing work to get the puck to you. I can't take credit for any of my goals. There's always a guy doing work that may not get the credit." 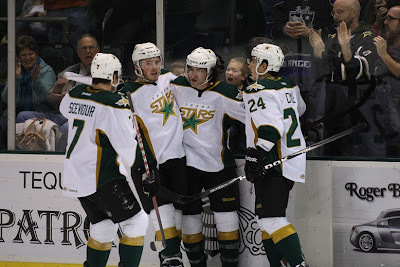 The Stars survived the last seven minutes of the period with San Antonio makes several spirited rushes up the ice. Newcomer Scott Campbell had a game-saving play in the crease as well, gloving a puck down and clearing it out. He should have been credited with a save on the play. With Markstrom pulled, Texas's Morin poked a puck past the point man and Mike Hedden potted his eighth of the season into the empty net for the 4-2 final. After sweeping the San Antonio Rampage's visit to the Cedar Park, Texas travels to Oklahoma City for a Wednesday night game against the Conference-leading Barons. Another game between these two comes tonight, and both teams need two points in the match. Texas is looking to crawl out of the cellar in the West Conference and make a run at the playoffs while San Antonio is looking to keep up its torrid win percentage from the first two months of the calendar year. As we discussed yesterday, the big pieces for San Antonio's turnaround were Dov Grumet-Morris (aka DGM) and Jon Matsumoto. In last night's game, Matsumoto generated two goals with primary assists and DGM stopped 40 of 44 in the loss. Solving these two players again tonight will be key to a Texas win. The biggest story from last night's game, however, was the Bracken Kearns hit on Stephen Schultz. Schultz immediately left the ice, bleeding from his eye, and was later diagnosed with a broken wrist. In my personal opinion, the broken wrist is the least of his worries at the moment. With the coming so high from Kearns, Schultz is likely under watch for concussion symptoms at the moment. Typical heal time for a wrist injury is going to be 4-6 weeks anyways, so we will not see him in a Texas Stars jersey for a while. There is no word as of noon today on possible PTO replacements, so Texas may have to roll eleven forwards. For San Antonio, losing Kearns to the automatic suspension from the match penalty and later likely league discipline is a big blow. The 31 year old forward is second on the team in points behind only Matsumoto (14-23-37). Kearns will remain suspended under the league office can rule on his hit and further discipline from it. In other news, Nolan Yonkman, who had two fights and an assist last night, is on his way to Florida as Colby Robak returns. According to Coach Weber, Robak will play in for tonight's game; he is an AHL All-Star guy who has 7-18-25 in 48 games played this season. Texas needed extra time to do it but finally broke out of their three game losing streak with a physical 5-4 shootout win in Cedar Park this evening. "We wanted to do everything we could to get out of the slump tonight," said Coach Pyle. "We played a full sixty tonight." Texas got goals from Schultz, Wathier and two from Fraser, including two power play tallies. Angelo Esposito and Travis Morin picked up two assists each. "Esposito's played well since he got here," said Pyle. "He made a great play on the power play and snaps the puck pretty well." This was an important game for playoff positioning. Texas is not out of it completely. "We were playing just well enough to lose on the road." Tyler Beskorowany picked up a good confidence win as well, allowing four goals on 32 shots but stopping all five in the shootout. The first period saw three goals for the two clubs among four fights and a match penalty. Francis Wathier laid out Mark Cullen in the offensive zone, drawing the ire of captain Nolan Yonkman. San Antonio opened the scoring just thirty seconds later with Michael Repik's backhander five-hole in tight on Beskorowany. Matt Fraser squared off for his second fight of the year, this time with James Wright just a minute later. Texas got things back to even with a power play goal from Stephen Schultz off a nice round-the-back pass from Angelo Esposito. Shortly thereafter, Nolan Yonkman took his second fighting major of the night with a tilt against Luke Gazdic. Evan Barlow put the Rampage ahead at 14:49 of the first, finishing off a nice pass from behind the net for a 2-1 score. Bracken Kearns got the fourth and final fight of the period as Brenden Dillon took him to task for a high hit on Stephen Schultz. Schultz left a pool of blood on the ice and would not return to the game. Coach Pyle said after the game that Schultz broke his wrist, but surely there was a head element to the injury as well. Kearns earned himself a match penalty for the hit that will surely get attention from the league. On the ensuing power play, Texas got even with Francis Wathier scoring on a net-front scramble to make it 2-2. Former Star Greg Rallo scored his twelfth of the year just past six minutes in, banking one in off the crossbar from the right wing circle. Matt Fraser evened things up again on a gift from the San Antonio defense, receiving a perfect pass in front of the net and scoring on DGM low stick side for the 3-3 tie. Texas started the third with a bang as Angelo Esposito bombed one on net, popping the puck off DGM's pad to Matt Frser, who made no mistake scoring his second of the night. Texas kept San Antonio down for most of the period, but Roman Deryluk tied things up with 2:28 to go to send things into overtime. With a scoreless OT period, the game went to a shootout, where Texas was 1-2 on the season and San Antonio 4-0. Texas's Beskorowany stopped all five San Antonio shooters in grand fashion, each time to greater screams from the crowd. Mike Hedden scored the Stars' only goal of the shootout, snapping one past DGM from the hashes. These two teams meet up tomorrow night again here in Cedar Park. Dan Spang was out tonight with a day-to-day injury of non-specific nature. Coach Pyle expects him back mid-week. Hubert Labrie is more of a week or longer situation. Coach Pyle is hoping to pick up another forward before tomorrow's game with Schultz out "for a while". With no forward scratches, Texas is down to eleven healthy forwards. They can roll eleven tomorrow night, but they would rather not. 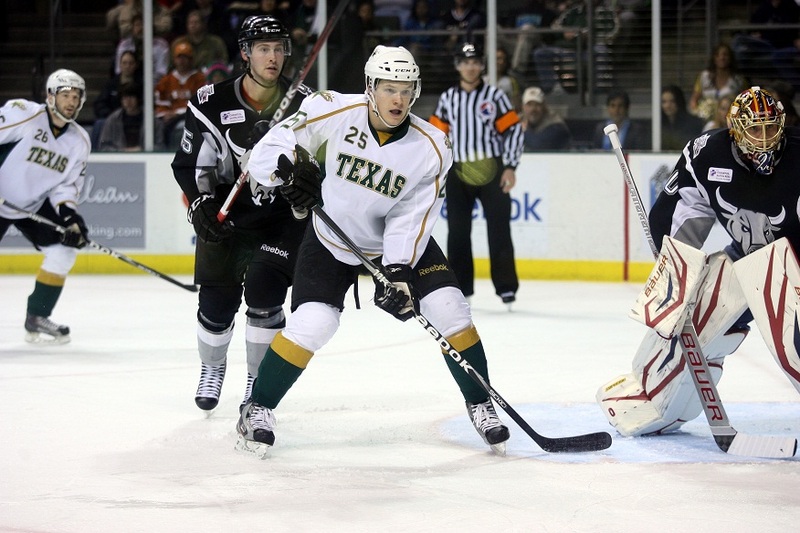 Texas is back in action at home tonight for the start of a two game set against teh surging San Antonio Rampage. Once mired at the bottom of the conference, the Rampage have rocketed to playoff contention, going 7-3-0-0 in their last ten and 12-6-0 since January 1st, including a seven game win streak. Their rise has been accompanied by the play of some key additions. In net, San Antonio added Dov Grumet-Morris to patch the hole left by an injury to Jacob Markstrom. "DGM" has been the goalie of record in every game of 2012 for the Rampage and is 16-8-2 overall on the season with 2.24 GAA and .923 SV%. Markstrom, now healthy, could see action in one of this weekend's games. With Markstrom being a Florida contract and needing to get ice time to be ready for a callup at a moment's notice, I would expect him in at least one of these two. Another huge acquisition for the Rampage was Jon Matsumoto. Matsumoto came over from the Charlotte Checkers in a trade between the parent clubs and has racked up the points ever since for the Rampage. In just eleven games, Matsumoto has four goals and nine assists for thirteen points. That is an impact player. Other impact forwards include the always reliable Brakcen Kearns (14-23-37), Mark Cullen (7-25-32) and vet Bill Thomas (16-12-28). Former Star Greg Rallo picked up his scoring pace over the back half of the season and is now 11-12-23, with 12 of those points coming in 2012. On Texas's side, they need to follow San Antonio's example. A 12-6 record is about what Texas needs through the rest of the year to make it into the playoffs. However, it does not look like Texas will be getting any help courtesy of Dallas at the current moment. If anything, they are hurting due to the callup today of Ryan Garbutt. Texas could receive prospects in trades if Dallas becomes a seller at the deadline, but at that point it would probably be too late for that to matter much. In the season series, Texas is 2-4-0-1 but still holds an overall all-time advantage of 16-10-0-3. In team history, Texas has only lost to San Antonio three times at home in thirteen visits. Following the injury of Jamie Benn last night, Dallas announced today that they have recalled Ryan Garbutt from the Texas Stars to fill his roster spot. Garbutt is fourth on the team in points but also first in PIMs. He needs to be disciplined in his time in Dallas. If he isn't careful, he could spend more time in the box than on the ice. He needs to fly low in terms of penalties but finish his checks and play the physical game he is known for here in Texas. The Dallas Stars announced on Friday that the club has recalled forward Ryan Garbutt from the Texas Stars, Dallas’ primary affiliate in the American Hockey League (AHL). Garbutt, 26, has played in 50 games for Texas this season, scoring 16 goals and 17 assists totaling 33 points. 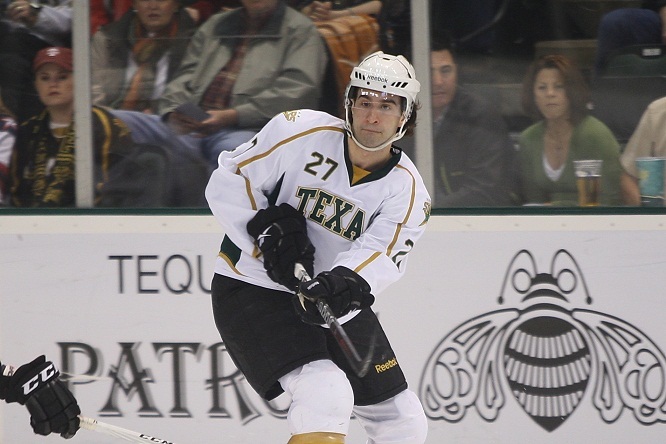 He ranks fourth in overall scoring for Texas and first with 96 penalty minutes. The 6-1, 195-pound forward from Winnipeg, MB was signed by Dallas as a free agent on Sept. 18, 2009. 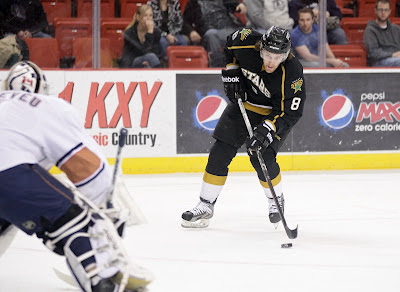 The Texas Stars have signed training camp invitee and current Idaho Steelhead blueliner Matt Case to a PTO. I have heard good things about Case's play in Idaho and he was a candidate to be added when Texas looked to add a defenseman earlier in the year and went with Mike Berube, also a training camp invitee. Case joins the squad as Texas has been rolling with only six healthy D since last weekend. This signing could indicate that Hubert Labrie's current injury is more serious than just a day-to-day thing. Depending on what Coach Pyle sees out of him, Case could knock Jace Coyle to the press box for either of the Stars' games this weekend. The Texas Stars announced on Thursday the team has signed defenseman Matt Case to a PTO (professional tryout agreement). 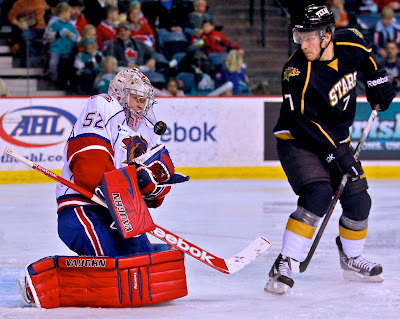 Case joins Texas from the Idaho Steelheads, Texas’ ECHL affiliate. The second-year defender has played in 41 games for Idaho this year, scoring two goals and adding seven assists for nine points. Case, 25, was second on the team with 59 penalty minutes at the time of his recall. The Plymouth, MN, native has played in 111 pro games, including two in the AHL with Norfolk near the end of the 2009-10 regular season. Prior to turning pro, the 6-foot, 200-pounder played four seasons at Ferris State University. In 144 collegiate games, Case scored ten times and assisted on 37 tallies for 47 points. He played collegiately with former Texas Stars forwards Cody Chupp, Mike Embach and Brenden Connolly. 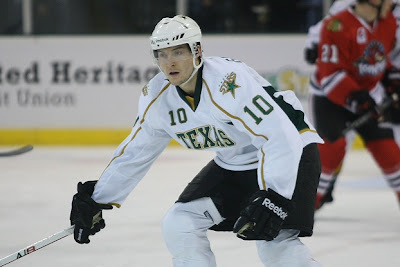 Case attended training camp with Texas in the fall of 2011 and played for Stars Head Coach Jeff Pyle in Gwinnett in 2010-11. Coming in on a two game losing streak, Texas needed a good start and a good game to set the ship right. The first period saw three goals against as that "Here we go again" feeling set in on the Stars' bench. Texas decided to make it interesting in the second period though, scoring three straight in just five minutes to even things up at three. However, living up to the consistently inconsistent moniker, Texas allowed Patrick Rissmiller's eventual game winner just 45 seconds into the third period. Tyler Beskorowany had a good, if disappointing, game with a baffling 40 saves on 44 shots. Lake Erie dominated the first period. As Texas struggled to get things rolling, the Monsters potted three goals on eighteen shots. Greg Mauldin went first on the power play, snapping a shot through traffic that beat Tyler Beskorowany glove side high. Five minutes later, Brad Malone slipped down the right wing side, beating Dan Spang and sliding a pass under a sprawling Jace Coyle to find Justin Mercier, who put it home for the 2-0 lead. Lake Erie finished off the period with a tip goal by Dean Strong from a Mark Olver shot. Texas finished the period down 3-0 with a shot deficit of 18-8. Beskorowany kept the Stars in the game through the first fifteen minutes of the second period, then Texas's offense took off. Francis Wathier got the first one at 14:27, finding the net off a repurposed puck from Angelo Esposito's initial shot. Three minutes later, Colton Sceviour potted his 12th of the year with another rebound goal off a mishandled puck by Gerald Coleman. The Stars completed the comeback with a power play goal in the final minute, another rebound goal this time from Scott Glennie, his 11th of the season. After two, Texas was tied at three but was being outshot 35-24. Just 45 seconds into the third period, Patrick Rissmiller's backhander, the first shot of the third, found twine and set the LE lead at 4-3. Gerald Coleman settled back in for the rest of the period after fighting the puck a bit in the second. The Stars play again this weekend with a two game set at home against the San Antonio Rampage. The Stars roll out of bed bright and early this morning in Cleveland to face the Lake Erie Monsters for the first time this season. Texas has not played Lake Erie since last season, almost a year ago to the date, February 16th, 2011, at 9:45 AM as well. Texas comes in having lost their last two on the road while the Monsters are 5-0-0-1 in their last six, having beaten Texas's West Division rivals Houston and San Antonio along the way. That streak is responsible for pulling them out of the basement and placing them in the playoff conversation. Contributing to the recovery has been the play of Gerald Coleman, a goaltender familiar to the Texas system, but not to the Texas Stars. The Idaho Steelheads would remember Coleman not-so-fondly as the tender who backstopped the Alaska Aces to a Kelly Cup last year and ended the Steelheads playoff run in the process. With the Monsters, he is on a PTO and has a 7-2-1 record with a 2.54 GAA and .928 SV%. James Reid, a callup from the Allen Americans, is the backup. Reid has only started one game this year, getting in mostly mop-up duty in three others. Leading scorer defenseman Tyson Barrie (5-24-29) is currently with the Colorado Avalanche while #3 scorer Hugh Jessiman (20-5-25) was just passed up for an SPC by Lake Erie and signed to one by the Heat instead, as they have been struggling recently with the loss of Krys Kolanos. Remaining top scorers include Evan Brophey (13-15-28), Ryan Stoa (10-14-24) and Luke Walker (8-15-23). Last year's hot shot rookie, Mark Olver, is back with the club after starting the season with Colorado. In just 14 games, he is 2-6-8. As to Texas, there are no rewards for last place in the American League. In the NHL, you get a top draft pick for your troubles; in the AHL, you get nothing. With 27 games remaining on the schedule, Texas needs a gargantuan effort to make it to the postseason for the third straight year. Only eight losses remain before Texas is realistically eliminated from contention. The march to the playoffs has to start today in Cleveland. Youth and a lack of finish have been talking points all year for the Texas Stars (21-24-2-2, 46 pts, #15 Western Conference). Those issues led to an inconsistent week for the Stars as an OT loss and come-from-behind win at home gave way to a five goal thumping in Rochester and a shutout loss against the then last place team in the conference. This team is seemingly stocked with talent, but the pieces are not coming together and haven't all year. Texas has spent most of the season outside of playoff contention and looks like they will finish it that way. As it stands, Texas is on pace for 71 points, tied with the Rockford IceHogs (Chicago Blackhawks) for last in the conference. The current postseason cutoff is at 84. To keep up with that pace, Texas needs no worse than 38 points in their remaining 27 games, or a 19-8-0 record. While the scheduling gods were kind in that Texas finishes with 16 of their last 27 at home, the playoff push could be over within the next few weeks depending on win-loss. Despite all the negativity surrounding three losses on the week, Texas did have a very positive game on Wednesday, coming back from down 3-0 to win 6-3, including a hat trick from Ryan Garbutt. Texas announced today that they have recalled Stephen Schultz from Idaho. After just two games in Idaho, Schultz added two goals, including a PPG, and an assist. Coach Pyle could use him in the lineup as a third line scoring punch. Texas got outmatched badly on the offensive side in Hamilton on Sunday. Schultz should be available for tomorrow's early game in Cleveland. 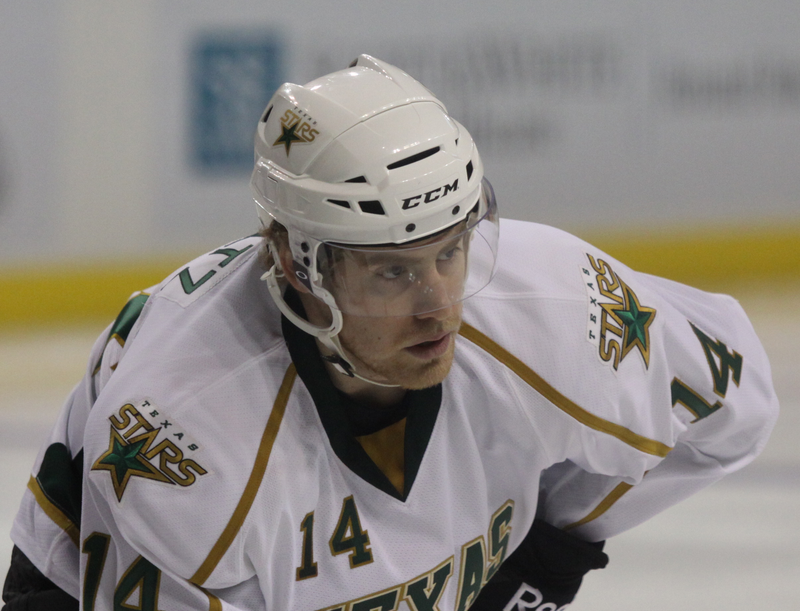 The Texas Stars announced on Tuesday that forward Stephen Schultz has been recalled from the Idaho Steelheads, Texas’ ECHL affiliate. Schultz returns to the Stars after scoring two goals and totaling three points in two games with Idaho. 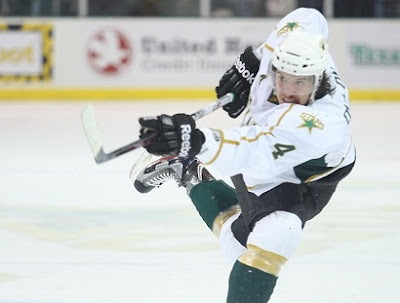 Prior to going to the Steelheads, he scored seven goals and totaled nine points in 32 games for the Stars this season. 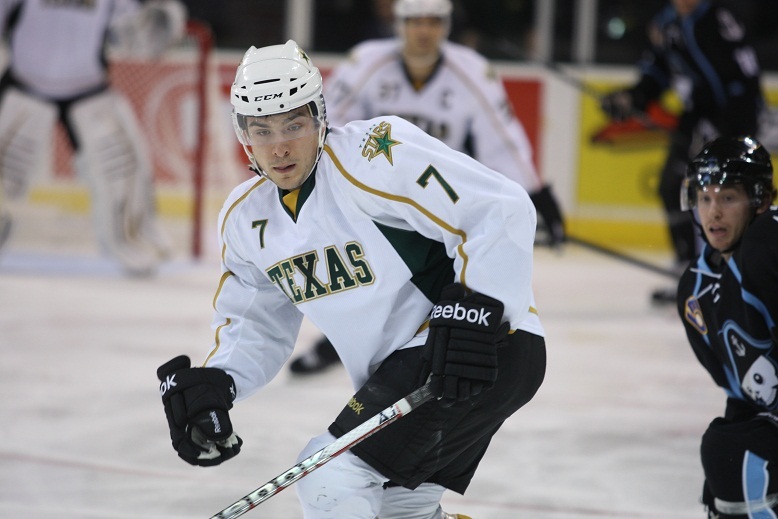 He joined Texas in late March of 2011 after concluding a four-year career at Colorado College from 2007-11. The 24-year-old rookie played in five regular season games without registering a point for the Stars in 2010-11. The 5-foot-11, 190-pound forward posted WCHA highs as a senior in 2010-11, scoring 17 goals and totaling 45 points in 43 games played. In his final two years as a Tiger, Schultz set up 43 goals and totaled 65 points in 71 games. For his collegiate career, Schultz scored 36 goals and totaled 86 points in 127 contests. The rookie played with current Dallas goalie Richard Bachman at Colorado College. For the third year now, the HDH playoff projections page is back. It took a little bit of tweaking to make everything work this time around, given the new conference format, but it looks good and today is the day we go live to the public. I have added an FAQ this year and tried to demystify more of the formulas. If you have more questions, ask them and I will consider adding them to the FAQ. In losing the last seven of eight games, the Stars playoffs hopes are dwindling after losing today to the worst team in the conference in shutout fashion. Despite third star worthy performance from their goaltender, Tyler Beskorowany, the Stars could not overcome Nathan Lawson's 39 saves and Ryan White's two goals. The Texas Stars (21-24-2-2, 46 points) were defeated by the Hamilton Bulldogs (21-23-1-4, 47 points) 2-0 in front of 4,804 fans at Copps Coliseum on Sunday. Hamilton goalie Nathan Lawson (13-13-3) made 39 saves for his fourth shutout of the season. Lawson stopped 15 in the first period and 13 shots in the second period to preserve the win. Bulldogs center Ryan White scored twice in the second period, helping Hamilton end its four-game losing skid. Texas goalie Tyler Beskorowany (6-12-0) made 25 saves, as the Stars fall to 10-16-0-1 on the road this year. Texas travels to Lake Erie to take on the Monsters on Wednesday, February 15th at 9:45 a.m. (CT). After a scoreless first period of play, Hamilton opened the scoring at 9:59 of the second period. Center Ryan White carried the puck through center and into the Texas zone down the right-wing wall. White cut to the crease and slipped a backhander passed Stars goalie Tyler Beskorowany for the 1-0 lead. He would strike again late in the period for his fourth goal of the season in as many games. White snapped a shot from the left-wing wall, through traffic and into the Texas net for the 2-0 Hamilton lead. The goal was set up by Captain Alex Henry with 12-seconds remaining in the period. After Friday's thumping, the Stars face the only team below them in the standings this afternoon. The Hamilton Bulldogs have had a rough season. Montreal has had a less than expected season, with their coach on the ropes and eventually getting fired as playoff hopes ran dry. The game in Rochester was completely forgettable, but really the past two game set shouldn't be forgotten for Texas as it seems to typify the season as a whole. After getting down early in both games, Texas was consistently inconsistent. In both games, they came back to tie things. On Wednesday, they tacked on three more; on Friday, they allowed six more. Playoffs clubs make it to the playoffs because they have consistency. It's something that the Stars have suffered with all season long. As to the Bulldogs, the biggest memories of the Dogs come from the 2010 playoffs, when Texas beat Hamilton in seven games to go to the Calder Cup Finals. Not too many players remain from those two teams on the current rosters, but one will be in a different jersey tonight as Garrett Stafford now laces them up for the Canadiens org and leads all defenseman with five goals and eighteen points. Among active skaters, Andreas Engqvist and Brian Willsie lead up front. In nets, Hamilton features the two headed tandem of Nathan Lawson (12-13-3, 2.72 GAA, .910 SV%) and Robert Mayer (7-11-1, 3.16 GAA, .900 SV%). How much is there you can say about a game that ended 9-4? Texas had the game tied at two after spotting Rochester a two goal lead in the first. Unfortunately, Texas's two goals were part of a seven goal second period and the other five were Rochester's. It was an uncharacteristic game as sterling defensive players like Sceviour and Wathier were both minus-4. I couldn't watch the game live, so here's the Stars release on the game. The Texas Stars (21-23-2-2, 46 points) were defeated by the Rochester Americans (22-18-6-3, 53 points) 9-4 in front of 5,675 fans at the Blue Cross Arena on Friday night. The Americans scored five times in the second period en route to a home victory over the Stars. Eight different Rochester skaters picked up a multi-point night in the win, led by Zack Kassian and Travis Turnbull, who both netted a pair of goals. Turnbull finished with a game-high three points and linemate Corey Tropp also picked up three points (all assists). Texas forward Mike Hedden scored once and added two assists for his first three-point night in the AHL. Rookie Matt Fraser, center Travis Morin and center Mathieu Tousignant also scored in the defeat. Rochester goalie Drew MacIntyre (8-11-2) got the win with 24 saves. Texas goalie Andrew Raycroft (7-7-1) suffered the loss, stopping 13 of 19 shots before he was pulled at 12:30 of the second period in favor of Tyler Beskorwany. The Stars travel to Hamilton to take on the Bulldogs on Sunday, February 12th at 2:00 p.m. (CT). Rochester claimed a 1-0 lead by opening the scoring at 11:13 of the first period. Left wing Zack Kassian snapped a wrist shot from the left-wing Texas circle, beating Stars goalie Andrew Raycroft for the games first goal. Kassian’s 14th goal of the season was assisted by defenseman Brayden McNabb for the 1-0 lead. Rochester increased its lead to 2-0 at 16:40 off a deflection by right wing Maxime Legault. Defenseman Shaone Morrison sent a point-shot to the Texas net and Legault tipped in his fifth goal of the season for the two-goal lead. In the second period, Texas charged out of the gates, striking for a pair of goals in the first three minutes. Rookie Matt Fraser opened the team’s scoring with a power-play goal at 2:05 of the period. Forwards Mike Hedden and Ryan Garbutt each had an assist on Fraser’s 22nd goal of the year. The Stars tied the game 2-2 just 59-seconds later. Winger Mike Hedden blasted a slapshot from the high-slot, beating Drew MacIntyre for his seventh goal of the year. Defensemen Dan Spang and Jace Coyle each had an assist on the play. Rochester countered by scoring five times prior to the end of the middle stanza. Mark Voakes tipped in a rebound at 3:51 of the period, giving the Amerks a 3-2 lead. Forward Derek Whitmore connected for his team-leading 18th of the season, a power-play goal at 8:56 that made it 4-2 Rochester. The Amerks scored their second power-play goal of the evening at 11:17. Forward Paul Szczechura tallied his tenth goal of the year for a 5-2 lead. Right wing Jonathan Parker tallied his third goal of the season at 12:30, making it a 6-2 game in favor of the home team. His goal ended Andrew Raycroft’s night, as he was pulled after making 13 saves on 19 shots. The Amerks closed out the second period with a shorthanded goal by Kassian, his second goal of the night, making it 7-2 after two periods of play. In the third period, Texas trimmed the Rochester lead to 7-3 off Mathieu Tousignant’s second goal of the season at 2:01 of the period. The Amerks answered back at 5:41 on Travis Turnbull’s first goal of the night, giving Rochester an 8-3 lead. The Stars countered with a power-play goal at 13:59 of the third period. Texas center Travis Morin tipped a Jordie Benn shot, scoring his eighth goal of the year and cutting the home team’s lead to 8-4. Rochester closed out the scoring with Turnbull netting his tenth goal of the season at 14:11 for the 9-4 final. This evening the Stars pay a visit to the Rochester Americans' home arena for the first time in team history. Thanks to conference realignment, all teams now play every other in their conference. Tonight's game marks the second matchup all-time for the two teams and the final one for the regular season. The Stars won the previous tilt by a score of 6-2 after spotting the Amerks a 2-0 lead in the first period. There really has been too much of this schizophrenia. Too many times where they have started poorly. Or were caught napping in the second period. While the Amerks have had the admirable trait of never quitting and always finding a way to battle, there have been too many nights when they got stuck in the starting gate. Why is pretty easy to understand: Youth. The biggest downfall or most common demerit for a rookie or young player is the inability to play the same game night after night for weeks. 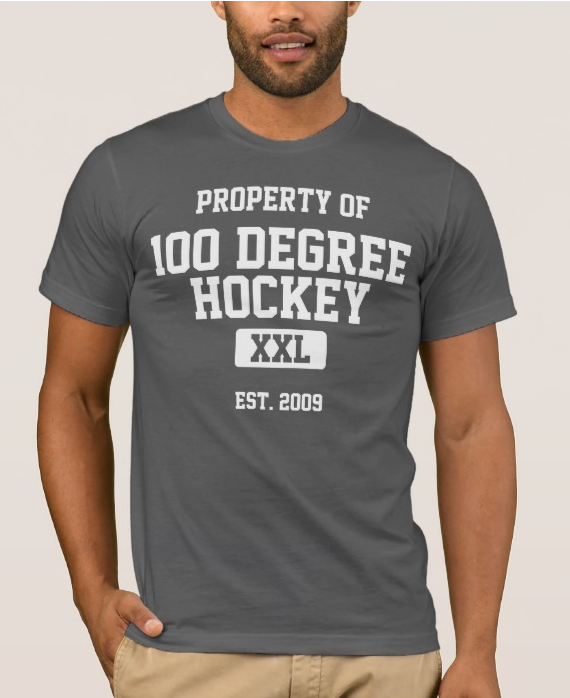 Inconsistency is why some players never make it to the NHL. It’s why some players bounce back and forth between the AHL and NHL. According to @LetsGoAmerks, Drew MacIntyre will get the start in net tonight for Rochester. Despite being a two-time AHL All-Star, MacIntyre has sunk in starting rotation behind David Leggio. MacIntyre has a 7-11-2 record with 3.01 GAA and .903 SV%. Skaters to watch out for on the Amerks include the rookie forward tandem of Marcus Foligno (12-17-29) and Phil Varone (7-20-27). Rochester is finally getting healthy as well with the return of Colin Stuart, Corey Tropp and Michael Ryan to the lineup. The Stars hope to continue their dominance in the North Division (3-0-0-0) and earn two more points toward a playoff berth. After Thursday's game action, Texas needs thirty-seven points in twenty-nine remaining games (at least 18-10-1) to keep pace with eighth. The Texas Stars broke a five game losing streak emphatically this evening with a 6-3 come from behind win over the Milwaukee Admirals. Texas allowed three first period goals but then roared back to score six unanswered, including three from Ryan Garbutt, to net the win. "It felt pretty good for the boys to come back like that from down 3-0," said Garbutt, who had the first regular season home hat trick in Stars history. Coach Pyle was extremely impressed with the character in the comeback win. "You're down by three and you say 'Oh no, here we go again', but they had a lot of character and battled back. That's what I love about them." Scott Glennie had a goal and two assists and Adam Pardy added three assists in the last game of his conditioning assignment. Milwaukee got the jump on Texas as Kyle Wilson cut across the crease, collecting his own rebound and sending one past Raycroft from the left side. It was Wilson's 12th of the year, coming at 5:12 of the period. Milwaukee would add two more in the first Zack Stortini potted his 7th of the season off a fat rebound that flew out to the hashes and was subsequently buried from the right wing circle. Texas got in penalty trouble late in the period as a slash from Tousignant and a salsh and a hook from Raycroft put them on two 5-on-3s. Texas would survive one but didn't survive the other, allowing their third goal of the game to Chris Mueller. The Stars came back in the second with a great effort. Sceviour went first as he accepted a cross-ice pass from Scott Glennie and ticked one off Jeremy Smith's glove and into the net for the Stars' first goal. Ryan Garbutt was up next with a slick five-hole marker coming down the right wing side. Scott Glennie performed an excellent give and go off a Pardy pass to break Garbutt free. Texas closed the period down only 3-2 but with a 27-19 shots advantage. The third period was all Texas as they completed the comeback in fine fashion. Ryan Garbutt got it started with his second of the night. Smith was screen by his own defender and never seemed to see Garbutt's shot from the top of the circles gloveside for the three all tie. Matt Fraser went next as Travis Morin found him cherry picking past the Ads defense. Fraser went backhand, forehand, and potted his 22nd of the season for the 4-3 lead. Past that, it was all gravy. Scott Glennie tapped one out of midair to make it 5-3 with 6:45 left in the third. Milwaukee would pull Jeremy Smith for the extra attacker and that's where Ryan Garbutt got his hat trick. Garbutt's empty netter made for the first home regular season hat trick in history and the first hat trick of the season. Overall, it was a great night for Texas to break the losing streak. However, only just five points out of the playoffs, Coach Pyle isn't looking at the standings. He is concentrating game by game, starting with the next one in Rochester on Friday. Following a five game losing skid, there's always bound to be a little bit of shakeup. Texas announced a total of four roster moves this afternoon, two of which we already knew. Texas will be subtracting three and adding just one. First, the addition is Jake Hauswirth, coming to Texas on recall from Rio Grande Valley. Hauswirth had one assist in eleven games with Texas earlier this year. He had three assists in four games while back with the Bees. Three subtractions also come today. The first two are PTO releases, Mike Berube and Brendan Connolly. Berube will return to Allen of the CHL while Brendan Connolly will head back to the Greenville Road Warriors. Berube was solid in his time in Texas, just five games, and set himself up to get a look in the future with Texas or another AHL club. Connolly was unable to produce while spending time on the third and fourth line but is a likely callup for an eastern conference AHL club in need of a forward. He had two assists in 12 games with Texas. Finally, and this is the puzzling one for me, Stephen Schultz has been assigned to Idaho by Texas. The Colorado College rookie has been quite good in his 32 games of action, scoring seven goals and two assists, given the rather limited ice time he usually gets. Schultz also earns shifts on the power play thanks to being a strong right-handed shot. Idaho plays tonight at home against Alaska, but Schultz will not be in the lineup. The Schultz move is the one that strikes the most at a shakeup. While Schultz hasn't been underperforming particularly much compared to the rest of the team, he is one of the few players in Texas that Scott White has complete autonomy over on movement. For most everyone else, Dallas has to get involved. The only other player on an AHL contract on the team is Mike Hedden. It's back-to-backs against the same team, so we don't quite have as much to discuss today. Milwaukee and Texas tilt for the second straight night this evening in Cedar Park. It will be the last meeting between the two teams this season. For all intents and purposes, it was a battle of the backups last night. Tonight's game could be the main event with rising star Jeremy Smith battling NHL vet Andrew Raycroft. Last night's 4-3 score was a bit atypical of the Stars-Ads rivalry. If those two netminders man the pipes tomorrow night, good money would go on a 2-1 game. As to how the Stars feel about the game tonight, Coach Pyle summarizes it, "[Last night,] we out played them; we out everything-ed them." They look to prepare the same way and play a similar game, hoping to get more fortuitous bounces early if they can earn a shot advantage. In the playoff race, the Stars are seven points out of 8th but still need 40 points to keep up thanks to a win by the Rampage today. That's 40 points in 30 games, or a record of 20-10. Here we go. In other news, Texas is expected to recall Jake Hauswirth today from RGV and send Mike Berube back to Allen. Be sure to come a little early to tonight's game as the Stars will be celebrating Brad Lukowich's 1000 professional games before the puck drop. For the Stars, tonight's game was a microcosm of the entire season. The Stars put 15 on Atte Engren before the Admirals managed a shot. Unfortunately, that shot and the next were both Milwaukee goals. "It seems like every bounce we get, we get two the wrong way," said Colton Sceviour. 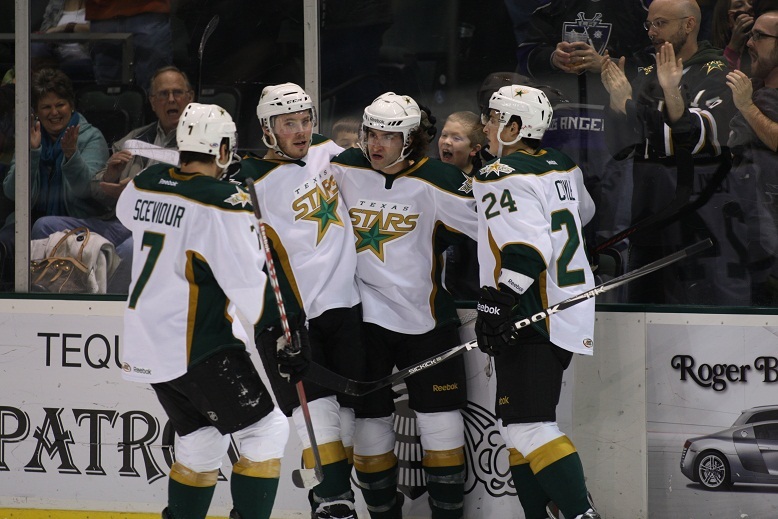 While Texas would score three unanswered goals, two from Sceviour, Milwaukee clawed back to win it 4-3 in overtime. "[Up 3-2 late], we have to find a way to win that game," said Coach Pyle. "There has to be more urgency." The OT loss broke Texas's pointless streak, but extended their winless skid to five. "We are struggling to win games," said Sceviour. "But one point is a step in the right direction." As previously mentioned, Texas bombed the Milkwaukee net with 15 shots early in the first period, including some power play shots as well. Milwaukee got the next four, scoring on two of them. The first goal was generated off a poor clear by Texas. "We put a puck off a guy's pad. That puck should be out of the zone, around the wall," said Pyle. The second goal came just three minutes later as Mark Van Guilder one-timed the puck past Beskorowany. Shots finished at a 15-4 advantage for Texas. Texas scored the next three with Colton Sceviour leading the way. Sceviour scored off his own rebound on the power play, assisted by Francis Wathier. The PPG broke scoreless streak going since January 21st. Travis Morin tied things up at two with a shot from behind the net, which found twine bouncing off an Admiral. Texas outshot Milwaukee 12-5 in the second. The Stars went ahead in the third with an embarrassing goal for Atte Engren. Engren flubbed a dump in from Colton Sceviour and allowed the go ahead goal from the red line. Adam Pardy assisted on the play. Texas had a chance to end it with a 63 second 5-on-3, both penalties coming on delay of game calls. They would not convert. "We were trying to make the fancy play, myself included," said Sceviour. "We have a fear of shooting the puck," said Coach Pyle. "That's where we need to step up." With five minutes left, Milwaukee would score on the power play to even things at three. Texas would have a spirited effort in OT, but Chris Mueller ended things for the Admirals in the extra period. Coach Pyle summed it up: "We give up our goals way too easy. Bottom line: those are easy decisions to make and we don't make the right decision and it ends up in the back of the net." On what Pardy brings to the team, Coach Pyle had this to say: "Energy, big body, experience, and skill. It's fun to watch him play to tell you the truth. He might have overhandled the puck a bit but he hasn't played in a while. Bottom line: it's good to see him come down and bring the energy that he brought." Texas Stars Report: "We Didn't Have Finish"
It's been a rough few weeks for the Texas Stars (20-22-1-2, 43 pts, #15 Western Conference), as they have not won a hockey game since January 21st and playoff hopes are dwindling in Cedar Park. In two games this week, Texas fell to the Aeros in Houston (Minnesota Wild) and the Charlotte Checkers (Carolina Hurricanes) at home. The two losses put Texas on a four game skid. Updating last week's points pace report, the Stars need forty points to stay on pace with the eighth seed in the West. With only 33 games remaining, the task is becoming more daunting by the day. The required .606 win percentage is made more difficult by the sixteen remaining games against their own division, against which Texas has a 9-15-0-2 record on the season. In the plus column, the Stars will play ten of the remaining seventeen against the North Division, which they have a 3-0 record against so far this season. If current pace holds, Texas could be the only team to miss the playoffs in the West Division. For Coach Pyle, it boils down to two things: self-discipline and finish. Concerning Saturday's game, he opined, "We missed four or five open nets, and the power play was sloppy. We had opportunities, but we didn't have finish." Also in Saturday's game, Texas had a rough time with unnecessary penalties: "The self discpline of shutting your mouth, doing your job and staying out of the penalty box: that's a big part of the game. That's probably the most important trait any player can have. That's where some of these guys struggle." The club that knocked Texas out of the 2011 Calder Cup Playoffs returns this week for their only two games in Cedar Park this season. The realignment of moving the Milwaukee Admirals to the Midwest Division means only two home games against the Ads this season, and this year they fall on back-to-back nights. Prior to Sunday's hard fought 2-1 win over Houston, the Ads were on a five game skid of their own, losing to Peoria (2), Rockford (2) and Chicago in that run. These two games in Texas give Milwaukee a chance to show whether the Houston win was a fluke or a trend. Texas is in a similar spot. Milwaukee is not currently a playoff bound team, giving the Stars a great chance to snap their four game losing streak and steal four points. Jeremy Smith (18-14-1, 2.40 GAA, .911 SV%) has taken the lionshare of the load in net over the past month with Atte Engren only getting one start for the Ads since January 13th. It is also fair to note that Tyler Beskorowany has not gotten a start since January 8th at Rockford, his only start of 2012. Coach Pyle has not shown hesitation in starting Raycroft on back to back nights. Depending on how things go tonight, maybe Coach tries Beskorowany as a slump-buster. Raycroft's once sterline 6-2-1 record has dropped to 6-6-1 with the recent skid. Chris Mueller (19-12-31), Kyle Wilson (11-19-30) and Juuso Puustinen (14-12-26) lead things up front. Meanwhile rookie Michael Latta (12-12-24) and vet Tyler Sloan (0-8-8) each maintain a gaudy plus-12 rating. For Texas, the time is now. The Stars need 40 points in their remaining 33 games to keep pace with eighth. As it stands, the Stars can only afford eleven more losses on the season and still have to play 16 more games against the division. Texas is even on the season series (1-1) but has good luck against Milwaukee traditionally (11-5 all-time). There's no time like the present to start the comeback run. The Dallas Stars announced today that they have assigned Adam Pardy to the Texas Stars on a conditioning assignment. Pardy has been a healthy scratch and has not played in Dallas since January 10th. He is being sent to the minors on a conditioning stint unrelated to the long-term injured reserve exception (13.9). 13.8 Conditioning Loan. Unless a Player consents, he shall not be Loaned on a Conditioning Loan to a minor league club. Such Conditioning Loan shall not extend for more than fourteen (14) consecutive days. Texas will see Pardy for two games, both against Milwaukee, before he rejoins Dallas in Columbus. This will mark the first time that a conditioning assignment has overlapped with home games. Previous assignments of Toby Petersen and Mark Fistric both happened during road trips. Given the temporary nature of the assignment, Texas should not be assigning any players to Idaho. The short story here is that Pardy needs ice time and had to consent to be sent down, so he arguably agrees. Despite a third period rally by Texas, Charlotte set the Stars to a four game losing streak this evening in Cedar Park. The effort was rather disjointed for the Stars, Coach Pyle admitted. "We missed four or five open nets, and the power play was sloppy. In our D zone, we should have been better. We had opportunities, but we didn't have finish." Texas got goals from Esposito, Garbutt and Morin, but couldn't overcome in the final minute with the extra attacker. Discipline was a big factor in the game as a boarding major in the second was negated by a roughing minor from Ryan Garbutt, who has had issues with retaliation this season. "I didn't like the penalties by Garbutt. We have to be more disciplined." "The self discpline of shutting your mouth, doing your job and staying out of the penalty box: that's a big part of the game. That's probably the most important trait any player can have. That's where some of these guys struggle, that's been Garbutt's biggest problem." Charlotte got things started in the first period with Zac Dalpe's eleventh of the season, assisted by Chris Terry and Nate Blanchard, a wrist shot from the right wing circle. Texas tied things up before the end of the period with a great effort by Angelo Esposito. Esposito slipped the puck from forehand to backhand and beat John Muse through the screen of his own defenseman for a five-hole goal, his third of the year. The low shot count in the first was led by Texas 6-5. Texas got a chance on the power play in the second with the aforementioned boarding call on Boychuk. Ryan Garbutt took two minutes off the power play with a retaliation roughing minor on the play. Travis Morin, one of the more veteran players on the team, talked to the difficulties of keeping a level head postgame. "Sometimes you get caught up in the moment. My mom got on me about it, 'I don't pay to watch you sit in the box.' It's hard for some guys to do. It's stuff we can't afford right now when we're struggling." Charlotte got a goal from Jerome Samson in the third on a play where the D got caught deep and forwards were covering. Charlotte pushed further ahead in the third with a second goal from Samson just 85 seconds into the third. Texas climbed back into the game twoard the end of the third as Ryan Garbutt's bad angle shot beat John Muse on the far side of the net for a 3-2 mark. With two men in the box, Texas's Travis Morin scored a special 3-on-5 shorthanded goal on a great individual effort. Morin said that he only remembers one other 3-on-5 goal in his career, once in his time with the South Carolina Stingrays in the ECHL. A few crossbars and empty nets were missed in the last few minutes of the game as a feverish effort from Texas kept fans on their seats but ultimately disappointed. The Stars are in action again on Tuesday against the Admirals. Fraser participated in morning skate but was held out of the game tonight. It is nothing major, likely something similar to his unexpected scratch earlier in the season. The last place Texas Stars face one of the best teams in the conference much less the league in the Charlotte Checkers this evening in Cedar Park. Texas is on a current three game losing streak at the hands of West Division opponents San Antonio, OKC, and Houston. Despite that grim outlook, Texas is actually up in the season series against Charlotte, taking two of three so far in the series, which ends this evening. Those three games were played back-to-back-to-back in early December. The last time around, netminding was a key strength for Charlotte with two of the top goalies in the AHL tending the cage for them. Justin Peters is on recall to Carolina and Mike Murphy is injured, leaving John Muse from Florida's Everblades to start in their stead. The rookie Muse has compiled an impressive 6-1 record, allowing just 1.48 GAA and .953 SV%. Scott Darling, who has played in the CHL, ECHL and SPHL this season, is the backup. I would not expect him to get a start in his stay in Charlotte, if the schedule allows. The Stars can hope that travel is a factor for the Checkers, who got in late Friday night after a road win in Oklahoma City. One other note from the Department of "It was only a matter of time" is that Tomas Vincour was recalled to Dallas late last night with the movement of Brenden Morrow back to the IR with an upper body injury. The Stars scored first but the Aeros scored three unanswered afterwards to put Texas below .500 and hand them a three-game losing streak. Andrew Raycroft stopped 32 of 34, and Ryan Garbutt got the only goal of the night for the club from Cedar Park. Houston's win broke up their six game winless streak in fine fashion. The Stars are back in action on Saturday against Charlotte at the CPC. Texas started off the scoring in the first period with a tip from Ryan Garbutt beating Matt Hackett off the initial shot from Angelo Esposito. Texas had a shots advantage for most of the period but Houston scraped back to hold a 10-8 mark after 20. The Stars gave up the lead in the second period with an unassisted tally. Casey Wellman pounced on a puck mishandled by Andrew Raycroft for his 14th of the season. The goal came during four-on-four after Texas pulled themselves off the power play with a goaltender interference call. The third period saw Houston pull ahead on the power play, their third chance of the night. Chay Genoway found twine, assisted by Fontaine and Wellman, to set the Aeros at a 2-1 lead. The Aeros would get another in the form of an empty net goal to win by a final mark of 3-1. All five teams in the West division are in action this first day back from the All-Star break. Texas travels to Houston, the last team they posted a W against on January 21st. That sparkling 4-3 SO victory capped a three game win streak and signaled what could have been the start of a real turnaround. The Ws buoyed the Stars to 10th in the conference and within striking distance of the top eight before the All-Star break. Of course, it is well known now that Texas dropped both before the break, sinking them to #13. Interestingly enough, Houston had a similar stumble into the break. They lost their last six coming into the break and are 3-4-1-2 in their last ten. There is quite a bit of value for Houston in their early stellar play though, as this skid hasn't dropped them out of home ice advantage yet. As to the game tonight, the Stars are a bit banged up. Sawada and Tousignant remain out with injuries and Brad Lukowich could be out this weekend as well. Both Sceviour and Labrie left Saturday's game in OKC and could be questionable for tonight. 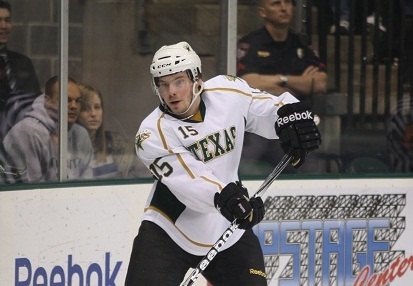 Texas announced today that they have recalled Jace Coyle from the Idaho Steelheads. This is an interesting development as Texas has seven defensemen already. This could signal a precautionary move for Texas with Brad Lukowich still coming off a bruised lung and Labrie having been taken out of the Saturday game in OKC. The Texas Stars announced on Wednesday that defenseman Jace Coyle has been reassigned from the Idaho Steelheads of the ECHL to the Texas Stars. Texas is Dallas’ primary affiliate in the American Hockey League (AHL) and Idaho is Dallas’ ECHL affiliate. 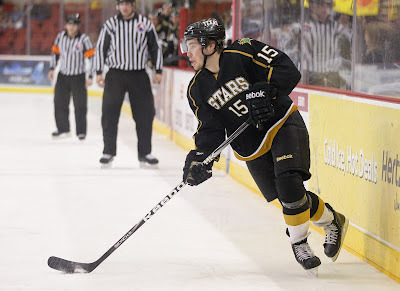 The rookie defenseman has split time between Idaho and Texas this year, recording an assist in 17 games with the Stars this season. The rookie defender has played in 13 games with Idaho, setting up two goals. The 21-year-old spent the last three years playing for the Medicine Hat Tigers of the Western Hockey League (WHL). The 5-foot-11, 185-pounder enjoyed his best WHL season in 2009-10, setting up 36 goals and totaling 46 points in 68 games played. In 241 WHL games from 2007-11, Coyle scored 25 goals and totaled 107 points. The undrafted defenseman attended training camp with the NHL’s Dallas Stars in 2011 and played for the Stars in the 2011 Traverse City Prospects camp.